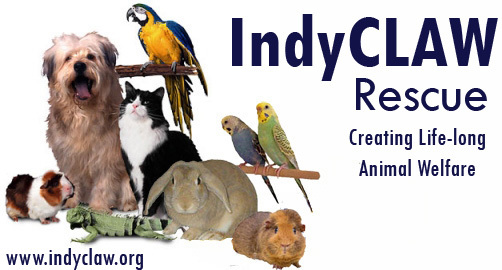 IndyCLAW Rescue is dedicated to finding the best possible home for our adoptable pets. Our motto is also our mission statement, Creating Life-long Animal Welfare. Our process is intentionally involved and takes time to make sure the adopter is committed to their new companion and will not have 'buyer's remorse' later and regret the decision and neglect the social needs of the pet. Our process begins with an application for adoption. If approved, you will be invited to visit our shelter to meet your desired new companion and for us to meet you. Many times we find that the pet you saw on the adoption listing isn't the one that you finally select. If all goes well, we schedule a home visit and will bring your selected pet to you. Our goal is to insure that their new environment will provide for their needs and provide a habitat for their 'life-long welfare'. We would then leave the pet for a 'sleep-over' trial period of a few days to make sure that it will fit into its new home and insure there will not be allergies or other conflicts. If all goes well, the adoption is finalized; if not, the pet would be returned to the shelter. For more information on keeping a rabbit as a house pet, please ask. At present the adoption application is not a web-form and cannot be completed online. or, fill out the word.doc, complete it, save it and send it by email to adopt@indyclaw.org. If neither of these options work for you, print and complete the application and contact us for a postal address.